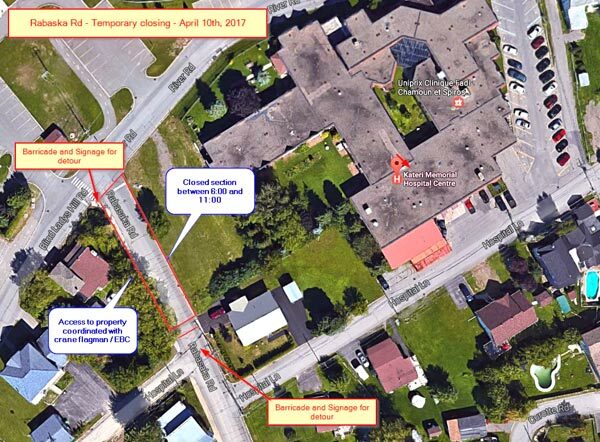 The Public Safety Unit (PSU) would like to inform road-users that a partial closure of Rabaska Road (near Kateri Hospital) will be necessary on Monday, April 10th from 6am to 11am. The closure is necessary for equipment installation on the hospital roof. Signage and barriers will be in place indicating the work zone and a flagman will be present during the operations to help detour traffic. See map of the work zone below. Please call the PSU at 450-632-0635 if more information is required.